We must not fear the unknown in our faith, but rather embrace it. There is no reason to be ashamed by the inscrutable aspects of God. Instead, we should point to these very mysteries as proof of His Being, for only when we stand in mystical awe do we truly experience the One worthy of worship. 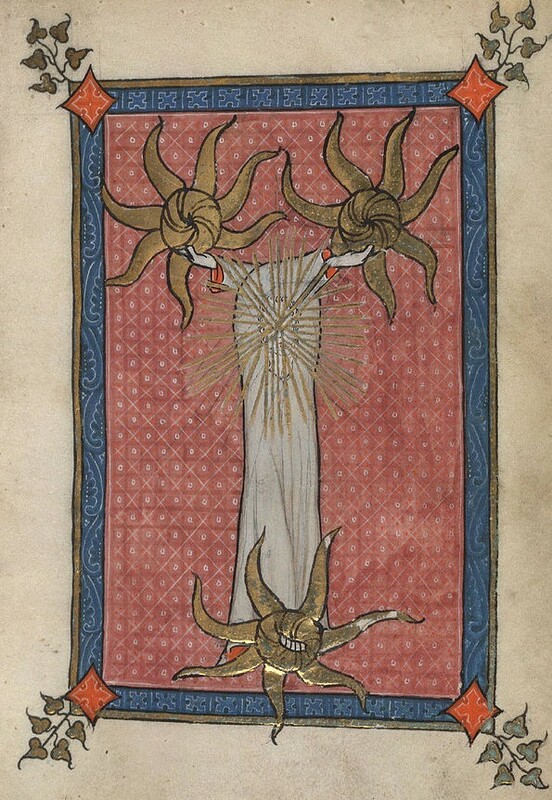 Meditative mystical image of the Trinity, from the early 14th-century Flemish Rothschild Canticles, Yale Beinecke MS 404, fol. 40v. Our finest moments in life lie beyond words: the inward tremor at a piece of music, the awe at nature’s grandeur, the silent symphony stirred within us by a work of art, the wonder of holding a newborn child, the thrill from the touch of a lover’s hand. All this and more is beyond words, beyond reason or mechanistic explanations. They are in the realm, not of emotion, but of pure experience. There are thin places where the numinous charges the material world and makes the mystical encounter with God possible. More: their utter irreducibility to mere language points directly to God. My own mystical experience is so far beyond the ability of words or reductionist explanations that I never even speak of it directly, and words are my living. There are things beyond knowing, beyond even feeling: things that the poet grasps better than the scientist, and which neither grasps fully. The most beautiful and most profound emotion we can experience is the sensation of the mystical. It is the sower of all true science. He to whom this emotion is a stranger, who can no longer wonder and stand rapt in awe, is as good as dead. To know that what is impenetrable to us really exists, manifesting itself as the highest wisdom and the most radiant beauty which our dull faculties can comprehend only in their most primitive forms–this knowledge, this feeling, is at the center of true religiousness. If the source of all that is had brought forth a world that could be grasped by our unaided intellect, he would be pretty poor deity. He dwells in absolute mystery, and we shall never grasp the essence of that mystery until we see face to face. Revelation can unveil Him only in part, and even then we can only know the depths of these mysteries by analogy. Since we know God is, and we know God cannot be grasped by unaided reason, the rest of the faith flows naturally. The evidence of our reason and sense, the gradual revelation by God himself, and the ultimate act, in which God shows us His face in the incarnation. Only mystery draws us in, inviting us to a deeper relationship with the unknown and unknowable. A mystery only inspires and drives us forward until it is solved, after which is is filed away and forgotten. God dwells in everlasting mystery, and like the veiled lover, this is why we pursue Him.